With the SA Navy facing budget and other challenges, it is looking back at past acquisition strategies to see what lessons can be learnt for the future. The SA Navy is facing a severe budget shortfall that is unable to stop the decline in the Navy’s capabilities. 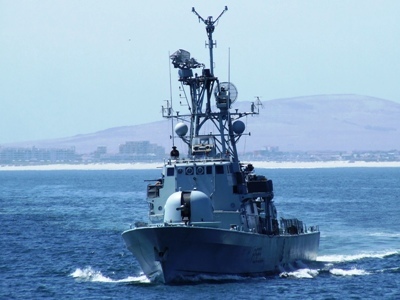 Although this year’s defence budget experienced a reduction of R5.8 billion, money was still allocated for the acquisition of a new hydrographic survey vessel (Project Hotel) and three new inshore patrol vessels (Project Biro). These acquisitions were only possible by tying the purchases into the broader Operation Phakisa objectives to fast-track development of the ocean economy. With much of the construction and supply chain being sourced locally, the projects enable significant and sustainable technology transfer and job and skills creation. Hlongwane said that Navy officers could hardly believe their luck because, after years of neglect by the defence planers, they were finally getting some very capable state of the art equipment. No tools, jigs or even much knowledge or expertise to refit the submarines were acquired. This, Hlongwane said, was disappointing as they had successfully refitted the (French-sourced) Daphne submarines delivered from 1970 in the Naval Dockyard a number of times and could fully support those boats. Even the frigates were acquired with very limited logistic support, including spares and training. Hlongwane said that the approach adopted was to see what was required, with the intention to fund more logistic support out of the operating budget, including spares, support equipment and additional levels of training. Unfortunately the operating budget shrunk and the contractors’ support capability was reduced. The SA Navy lost some of the limited number of people they had invested training in, whilst industry also lost some of those who had been involved in the development of the combat suite. Although some supplementary funds within the operating budget were sourced to buy more logistics, the operating budget was put under increasing strain by the introduction of the sophisticated new platforms. Hlongwane referred to the acquisition of the strikecraft in 1977, under Project Japonica. Although the SA Navy felt that these vessels were unsuitable for their needs, they were still purchased for political as well as strategic reasons. So what did the Navy do right? A combat proven off-the-shelf ship was purchased. Whilst the first three vessels were built by the original manufacturers in Israel, South Africans were on site to gain expertise, with the remaining ships built in Durban by Sandock Austral (now Southern African Shipyards). It had been planned to build 12 hulls, so the full equipment fit, including radars, weapon systems, engines, generators, etc. were acquired. Although the last three hulls were cancelled, the full complement of equipment was still received. The original supplier provided extensive training, including factory level courses down to the minutest detail. The Navy invested heavily in training, built a comprehensive training school in Durban with full simulation capability and licenced the electronic systems. The only thing the Navy still had to rely upon from the overseas supplier was software support, which was mostly mature, simple and reliable. Naval Base Durban became a well-equipped dedicated strikecraft support base, with a well-stocked stores depot and engineering support. Importantly, the strikecraft was a known system. Hlongwane acknowledged that it may be too simplistic to compare the two classes of vessels, as the strikecraft are primarily small surface warfare platforms, whilst the frigates are genuine multiple purpose, multi-dimensional ships with organic air capability. However, to do so one could learn valuable lessons. The frigates are highly complex ships incorporating leading edge technology that was always going to be a challenge to support in the South African operating environment, whilst the strikecraft were robust, relatively simple systems of a mature and proven design. The strikecraft were acquired with more than adequate support for a fleet of 12 ships, even though only nine were built. While it may appear to be an expensive concept, the SA Navy has successfully managed to support the strikecraft for over 40 years. However, Hlongwane remarked, that for reasons not always under the control of the Navy, they did not acquire adequate logistic support, including training, spares support and equipment for the frigates.